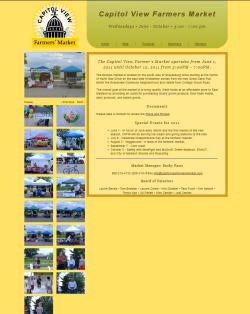 Capitol View Farmers Market was built with the CakePHP framework making full use of Cake's MVC architecture. Models have been constructed for products, vendors, sponsors, schedules and months. The product-vendor relationship powers the product search while the product-month relationship creates the list of products in season by month. Elemental Safety is a start-up company offering in-home and commercial lead testing. 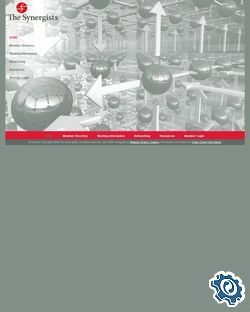 Elemental Safety's website was designed with Drupal which allows them to maintain the content on their site without delays involved in contacting me. Elemental Safety is now out of business and I have password protected the site I did for them so Google won't pick it up. To view the site, user the User Name 'es' and Password 'seesite'. 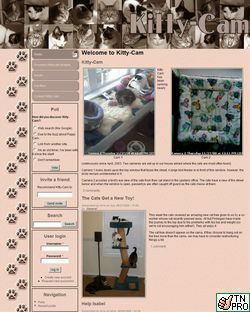 Kitty-Cam was created using Drupal 5.x and revolves around two webcams aimed at my cats. This site is meant to have more of a fun and playful look rather than a strict professional look that you might see on business sites. Although it has a few "social networking" features like a message board, the primary focus is on the webcams which drives traffic to the site. 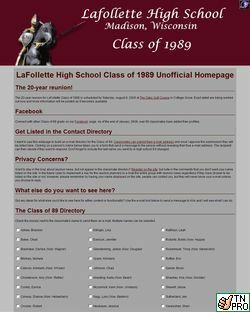 I designed this site for my graduating high school class. This site was coded in PHP only without the use of a CMS like Drupal. I chose to do it this way as with so many existing social networking sites, I didn't have the need to add that to this site. Plus, I wanted the specific functionality of an e-mail directory without requiring the user to create an account. Given the small scope of this project, I coded it in PHP rather than trying to get the functionality I wanted with Drupal's API. This project was completed as part of a group project effort for my design class at Madison Area Technical College. What you are looking at is a collection of the efforts of six different groups. My group provided the HTML and CSS framework. Since the emphasis of this class was design over code, most groups designed their site with graphics software which was acceptable for the project specifications. My strengths lie with HTML and CSS and I found it much quicker to code the framework rather than lay it out in a graphics program I didn't know well. This design was completed through Cedar Creek Web Design. The neighborhood needed a way to make their documents available to their residents and also have a place to get feedback on their plan. I chose Drupal for this project since that met all their needs. Neighborhood leaders currently maintain the site while I am available for any larger design changes. This site was designed at the request of the President of my Homeowners Association. Drupal 6.x runs on the back end and it provides just some basic functionality including a contact form, document library and information on mailboxes. I wrote a small Drupal module to customize the out of the box Drupal contact form to include additional fields that were needed on the form. The other option was to use Drupal's webform module, but that seemed to heavy for this small site. 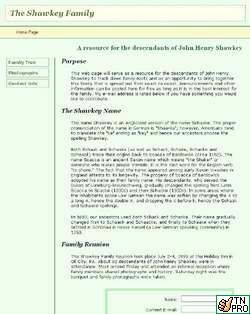 This is a simple HTML/CSS site with a clean design that provides some basic information on the Shawkey family name. This site will likely be upgraded to Drupal in order to provide a larger family tree and other information related to the family name. 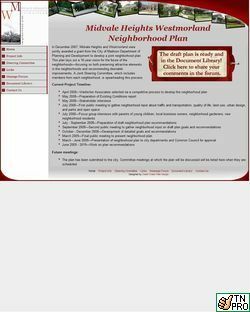 This was the first site I ever did in Drupal for my neighborhood association. The neighborhood likes it, but I want to re-visit it and find ways to better organize the content. The site is currently in Drupal 5.x and needs to be upgraded to Drupal 6.x to take advantage of new functionality. Once that is completed, other neighbors can be trained to help maintain content. This design was completed through Cedar Creek Web Design. 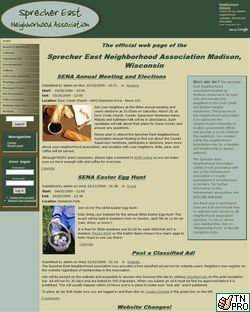 The look and layout of the site was provided by one of Cedar Creek's designers. She laid out the site in Photoshop and then I "snipped" the design to pull the graphics I needed in the XHTML/CSS template I created for Drupal. Members can log into the site to enter and update their profile. Club officers update the meeting information. When members are logged in, they also have access to each other's e-mail addresses. E-mail addresses remain hidden for the general public for privacy and spambot reasons. Before discovering Drupal, I used Website Baker as my content management software of choice. 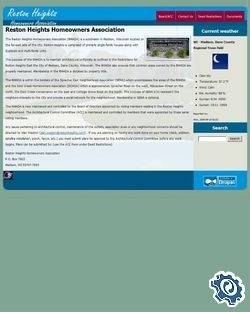 This site was designed using WSB and provides a simple user interface for the club's site mainainer to keep the content fresh with little help from me. 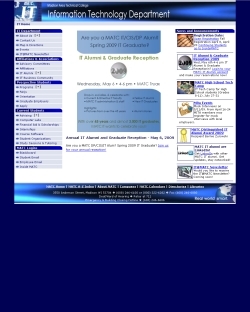 I would like to re-visit this site and convert it to Drupal which will provide additional functionality. 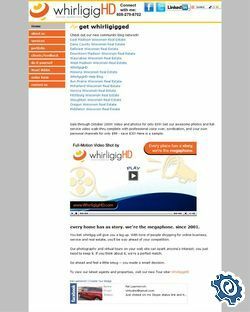 Whirligig Marketing was in need of a way to accept online requests for their services as well as educate customers on what they can provide. This site is currently maintained by the business owner with larger design changes implemented by me. 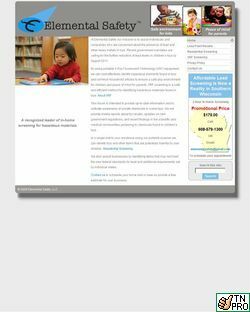 Shown here are website designs I have completed. Sites were designed with HTML/CSS for static sites, HTML/CSS with PHP for sites that had more of a dynamic element and with Drupal for larger sites that required a more advanced menuing system, search capability or had a social networking element. 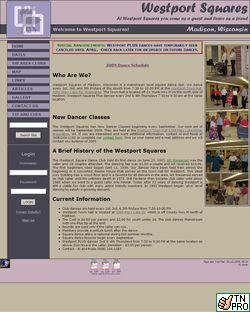 Click on the image for more details on how the site was developed. I am currently studying to be a web application developer as I don't consider myself to be a "designer". However, if you have a small web project that you would like me to consider, please .